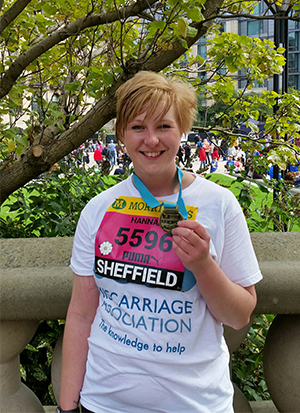 Hannah recently completed the Great Yorkshire Run, raising funds for the M.A. Here’s what she wrote about the experience. “I had a brilliant day. It took me 1 hour and 22 minutes to complete, and I wore my Miscarriage Association T-shirt with pride. Thank you for all your kind words and support. I think you all do an amazing job and I was so proud to have run for an amazing charity today. It was a very happy but emotional day.